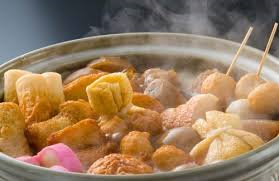 Oden is a Japanese winter dish consisting of several ingredients such as boiled eggs, daikon, konjac, and processed fishcakes stewed in a light, soy-flavoured dashi broth. Ingredients vary according to region and between each household. Daikon (kina radish), potatis, beef and so on.